Surviving Mars: Space Race also received a new trailer detailing the DLC's features. Surviving Mars: Space Race, the first DLC for Paradox Interactive and Haemimont Games' sci-fi colony simulator, is set to launch on November 15th. The DLC's main focus falls on sponsors, bringing in two new ones, in the shape of Japan and Brazil. All sponsors are also receiving an unique vehicle and buliding, alongside a set of optional objectives that aims to differentiate them from another. New in-game events are also making their way in, the feature breakdown trailer highlighting one involving the ever-pesky Flat Mars Society. 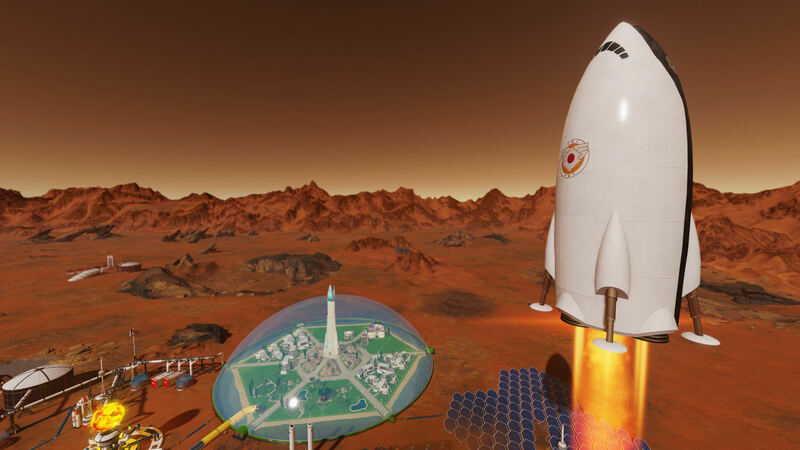 In Surviving Mars: Space Race, players compete against AI-controlled colonies for certain milestones. That, however, won't stop colonies from trading or supporting each other when the situation demands it. A rocket from the other side of the planet arrives faster than one sent from Earth, after all. A standing system tracks how others colonies see you. Befriend someone and they might be inclined to trade some tech. Their rivals, or those you insulted because you just felt like doing so, won't be as keen to collaborate. That's not a complete loss, however, as it opens the way to stealing valuable colonists from them or sabotaging their expedition. Surviving Mars: Space Race can be pre-ordered individually for the discounted price of $11.69. The DLC is also part of the Surviving Mars Season Pass.